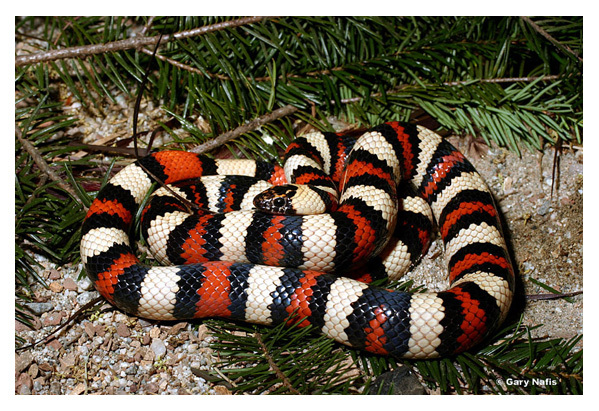 The California mountain kingsnake is an uncommon resident occurring throughout the length of the Sierra and Cascades and locally in the Coast Range the entire length of the state. Also found in the San Bernardino, San Gabriel, and San Jacinto Mts. Elevational range from near sea level coastally to 2450 m (8036 ft), or above, in the southern mountains. Feeding: Diet includes lizards, smaller snakes, nestling birds and bird eggs, and small mammals (Fitch 1936, Petrides 1941, Cunningham 1959). Cover: Most common in the vicinity of rocks or boulders near streams or lake shores. May also utilize rotting logs and seek cover under dense shrubs. Reproduction: Little information on specific habitat requirements for breeding or egg laying. Probably lays eggs in loose well-aerated soil under rocks or other surface objects or within decaying logs. Water: No information on water requirements but usually found in the vicinity of streams, lakes, or wet meadows. Pattern: Occurs in a variety of habitats including valley-foothill hardwood, and hardwood-conifer, mixed and montane chaparral, valley-foothill riparian, coniferous forests, and wet meadows. Activity Patterns: Diurnal and crepuscular activity mid-March to mid-October but with period of activity more restricted at higher elevations. Probably some nocturnal activity during the warmest periods (Stebbins 1954). Seasonal Movements/Migration: No information. At higher elevations may migrate to and from winter hibernacula which probably occur in boulder areas. Territory: Unknown. Aggressive defense of sources has not been observed in the wild. Reproduction: Mating occurs from March to May. Clutch size is thought to be 4-12, but clutches of 5-6 appear most common. Hatching occurs from late June to early October. Niche: Adults and young are probably taken by predatory birds such as hawks and occasionally owls. Adults, young, and egg clutches may be taken by mammals such as skunks and raccoons. General Comments: The population ecology and habitat requirements of this uncommon and sometimes localized snake require further study. In some localities in the southern mountains, populations appear to be threatened by collecting (see Newton and Smith 1975), which continues despite the efforts of protection agencies. In other localities the potentially detrimental effects of logging activities on this species should be evaluated. The head is generally all black. Having colorful triads the length of the body. The Kingsnake grows to about 2 to 4 feet in length. They are found in the mountain ranges between 3,000 up 8,000 feet elevation. They primarily eat lizards, however adults will eat rattlesnakes (hence the name "Kingsnake"). They begin hibernation sometime in October, emerging sometime in mid-March. breeding occurs from the end of April till the middle of June. Eggs are laid 3-9 in a clutch sometime in July and August hatching in September and October.